The Technical Advisory Group meetings are a proven instrument for promoting a direct dialogue between the member companies and institutions in the IKV Association of Sponsors and the scientists at IKV. 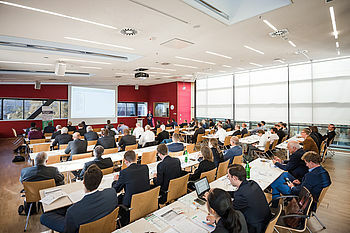 Active participation in the meetings provides insight into the IKV’s research activities at a very early stage – into future processing methods, technologies, systems and materials. This gives our members a competitive advantage. The meetings are explicitly arranged to obtain feedback and hear about members’ experiences, while, at the same time, giving members the opportunity to have a say in shaping the research activities at the Institute. Don’t miss this opportunity to engage in discussions with experts from industry and the experts at IKV. We look forward to your active participation. Please notice that the Technical Advisory Group meetings are held in German language. Venue: All the meetings are held in the SuperC at RWTH Aachen, Templergraben 57, 52062 Aachen. Time: Nine meetings are held on the different research areas over a period of three days – some meetings are held in parallel. Documents online: All the relevant documents are made available for the participants of a specific meeting to download. The programme and the precise schedule for the Advisory Board meetings in 2019 is still to be announced. If you would like to register for the advisory board groups or require further information, please log in to the member area of our website.